Use this tool to create a simple or multiple linear regression model for explanation or prediction. Available in Excel using the XLSTAT software. 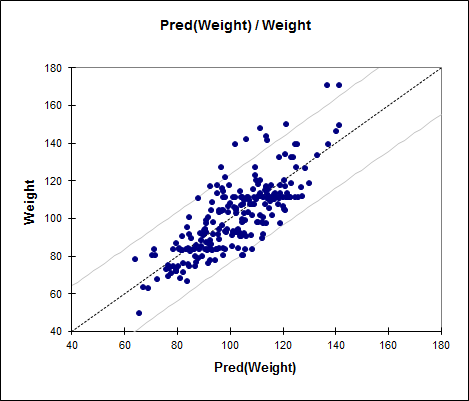 Linear regression is, without doubt, one of the most frequently used statistical modeling methods. A distinction is usually made between simple regression (with only one explanatory variable) and multiple regression (several explanatory variables) although the overall concept and calculation methods are identical. Best model: This method lets you choose the best model from amongst all the models which can handle a number of variables varying from "Min variables" to "Max Variables". Furthermore, the user can choose several "criteria" to determine the best model: Adjusted R², Mean Square of Errors (MSE), Mallows Cp, Akaike's AIC, Schwarz's SBC, Amemiya's PC. Stepwise: The selection process starts by adding the variable with the largest contribution to the model (the criterion used is Student's t statistic). If a second variable is such that the probability associated with its t is less than the "Probability for entry", it is added to the model. The same for a third variable. 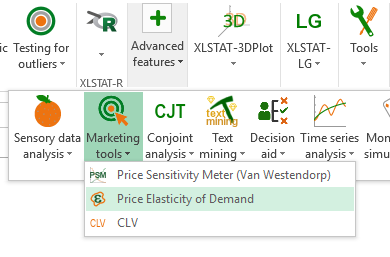 After the third variable is added, the impact of removing each variable present in the model after it has been added is evaluated (still using the t statistic). If the probability is greater than the "Probability of removal", the variable is removed. The procedure continues until no more variables can be added or removed. 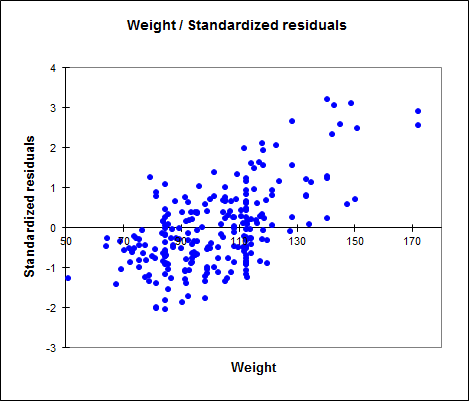 The normality of the residuals can be checked by analyzing certain charts or by running a Shapiro-Wilk test on the residuals. For this, you need to activate the respective test in the Test assumptions sub-tab. The independence of the residuals can be checked by analyzing certain charts or by using the Durbin-Watson test (under Time Series menu). Homoscedasticity and independence of the error terms are key hypotheses in linear regression where it is assumed that the variances of the error terms are independent and identically distributed and normally distributed. XLSTAT allows to correct for heteroscedasticity and autocorrelation that can arise using several methods such as the estimator suggested by Newey and West (1987). Type I SS table: It is used to visualize the influence that progressively adding explanatory variables has on the fitting of the model, as regards the sum of the squares of the errors (SSE), the mean of the squares of the errors (MSE), Fisher's F, or the probability associated with Fisher's F. The lower the probability, the larger the contribution of the variable to the model, all the other variables already being in the model. The sums of squares in the Type I table always add up to the model SS. Note: the order in which the variables are selected in the model influences the values obtained. Type III SS table: It is used to visualize the influence that removing an explanatory variable has on the fitting of the model, all other variables being retained, as regards the sum of the squares of the errors (SSE), the mean of the squares of the errors (MSE), Fisher's F, or the probability associated with Fisher's F. The lower the probability, the larger the contribution of the variable to the model, all the other variables already being in the model. Note: unlike Type I SS, the order in which the variables are selected in the model has no influence on the values obtained. 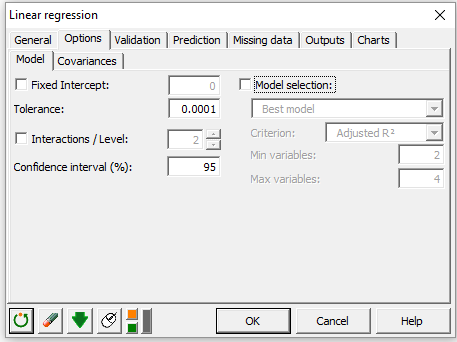 Predictions and residuals table: The predictions and residuals table shows, for each observation, its weight, the value of the qualitative explanatory variable, if there is only one, the observed value of the dependent variable, the model's prediction, the residuals, the confidence intervals together with the adjusted prediction if the corresponding options have been activated in the dialog box. Two types of confidence interval are displayed: a confidence interval around the mean (corresponding to the case where the prediction would be made for an infinite number of observations with a set of given values for the explanatory variables) and an interval around the isolated prediction (corresponding to the case of an isolated prediction for the values given for the explanatory variables). The second interval is always greater than the first, the uncertainty being larger. If validation data have been selected, they are displayed at the end of the table. 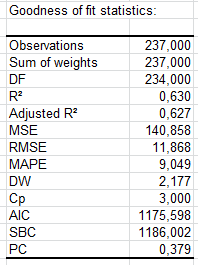 The table of influence diagnostics displays for each observation, its weight, the corresponding residual, the standardized residual (divided by the RMSERMSE), the studentized residual, the deleted residual, the studentized deleted residual, thee leverage, the Mahalanobis distance, the Cook's D, the CovRatio, the DFFit, the standardized DFFit, the DFBetas (one per model coefficient) and the standardized DFBetas.